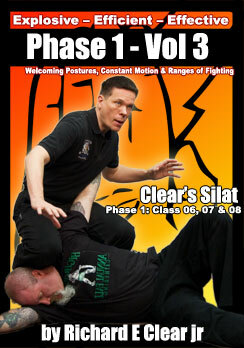 In the last post I stated and detailed the first 2 steps to Clear’s Silat Ranges of Fighting. The 3rd step of Clear’s Silat Ranges of Fighting was introduced and will be elaborated on in this post. The 3rd step for proper utilization of Clear’s Silat Ranges of Fighting is to learn how to transition from one range to another effectively. An example of this is training how to get from 1 to 2 steps out of Kicking Range into Pukulan “Collision” Range in a way that does not cause you to get hit but allows you to go all of the way in and through your opponent with your various techniques. Silat is a closing art. A closing art closes in on the opponent and goes all of the way into and through them finishing by coming out the other side. You will want to train to go all of the way into the opponent starting from various distances and positions and carefully /safely training to go all of the way through them. This is not just a grappling position. It is a collision that is closer and completely flush to the other person leaving no available or open space for most holds and grapples with the idea being to go through the opponent and to break them in the process. I have had a fair amount of grapplers look at me funny when they first hear this and then when they see or feel it they quickly agree that the majority of grappling arts popular today need a little bit of space between the 2 practitioners for the grappling arts to be effective. A NOTE HERE: Practice carefully and safely. It is hard to find partners if you hurt those you practice with and people who are seriously injured by you playing to rough tend to want to harm you back when they are in the sweet position to do so and sometimes sooner. Please be careful, safe and professional in your training. You may have noticed that grappling is not a range in Clear’s Silat. That is because trapping and grappling / breaking just like striking can occur at every distance. So, which distance is grappling? All distances can be used to trap, grapple and break. 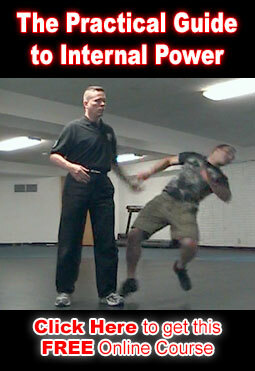 To train the Silat Closing Art carefully practice and train to go in and through an opponent starting from various positions and distances using your various tools and techniques. Work to always end up on the other side of the opponent to continue running or fighting after you have broken through them. Being able to smoothly and efficiently work / fight through the ranges and get finishing breaking moves that immediately end the situation is a signature technique of most real Silat.